Mr. and Mrs. Ralph Slazenger (who purchased Powerscourt and its contents in 1961), sold Christie's house sale, 24-25 September 1984, lot 488 with premium (IR 20,520 inc. premium). With Trinity Fine Art 1997. 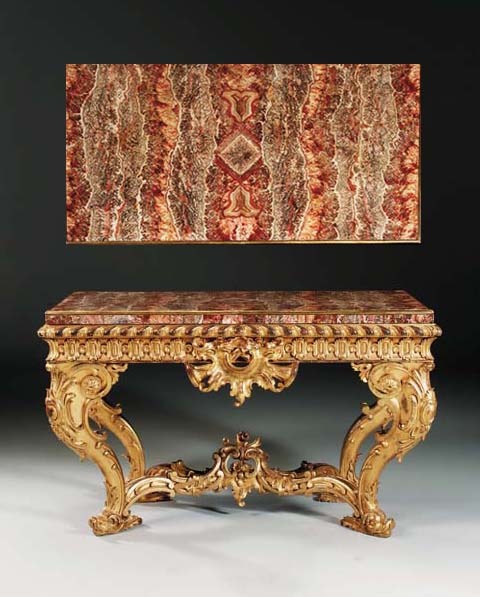 This beautiful golden-framed table-top of rose-flamed French marble is mosaiced with alabaster in the mid-18th Century Roman manner. Its lozenged compartment, serving as a trophy to recall Rome's Temple of Venus, is flowered with trompe l'oeil laurels amongst festive ribbon stripes that resemble striated flutings on ancient sarcophagi. The manufacture of such objets de vertu was discussed by the Soho cabinet-maker/marchand mercier James Cullen (d. 1779) when planning the Earl of Hopetoun's pier furnishings for the great drawing-room at Hopetoun House, South Queensferry. The 'pier-sets', whose execution spanned the period 1758 to 1766, comprised marble-topped tables, whose frames were serpentined and scalloped around love-trophies of roses, sacred to Venus. Their accompanying 'Roman-medallion' pier-glasses, designed en suite by the celebrated carver Matthias Lock (d. 1765), displayed foliated cartouches embossed with 'Cupid's target', and accompanied by floral wreaths, reed-gadroons and festoons of laurels. They were conceived in the 'picturesque' fashion that Thomas Chippendale popularised with The Gentleman and Cabinet-Makers Directors, 1754-1762 (see A. Coleridge, Chippendale Furniture, 1968, figs. 412 and 411). This pier or sideboard-table frame is likewise designed in the 'picturesque' manner, and displays a trophy of fruit and flowers emblematic of Ceres, beneath an Arcadian antique-fluted and reed- gadrooned cornice and a frieze that is wreathed by a fretted and scalloped ribbon-guilloche. The trophy is stretcher-tied to flowered and acanthus-wrapped 'truss' feet, which are supported by embowed dolphins in celebration of the triumph of Venus, the nature deity. The marble may have been supplied to James George Hamilton, 7th Duke of Hamilton and 4th Duke of Brandon (d. 1769) by Cullen, whose trade in such 'furniture' was eased by the diplomatic bag of the Count Pignatelli, the Neapolitan Minister (ibid., p. 160). In addition its frame ornament relates to that of Cullen's 'pier-sets' in Hopetoun's drawing-room, and to another 'Hope' pier-glass displaying embowed dolphins (ibid., fig. 419). Amongst related 'picturesque' table-frames supplied in the mid-18th Century, are a pair from Norfolk House, London displaying love-trophies that celebrate Mercury's role in Cupid's education (see S. Jervis, 'Furniture at Arundel Castle', Connoisseur, March 1978, p. 216, fig. 17). The Hamilton table-frame displays the label of the Glasgow carver and gilder W.M. Murray.